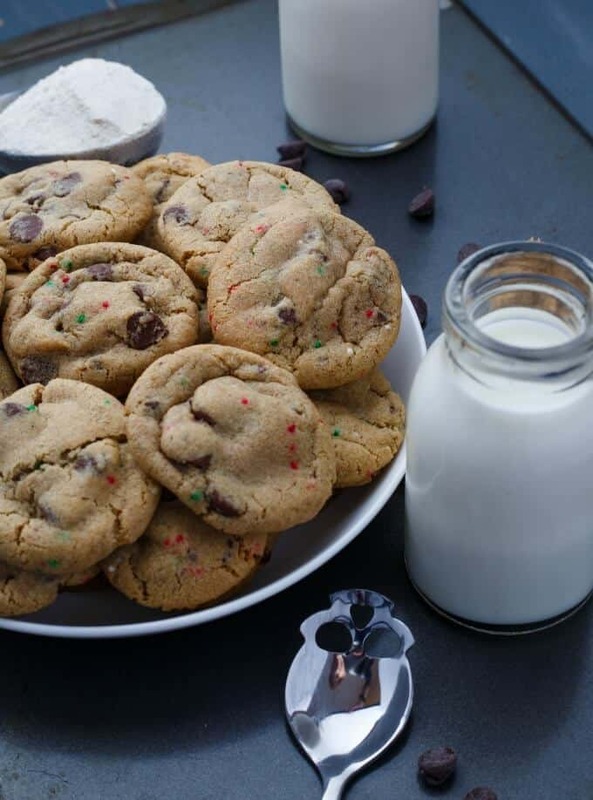 The photos and recipe for these gluten-free peppermint cookies with chocolate chips have been updated as of December 2nd, 2016! My peppermint and chocolate chip cookie combination continues! I said there would be a gluten-free recipe one of these weeks, and today is the day. I like working with Robin Hood Nutri Flour Blend (gluten-free, no affiliation!) because there are a lot of people out there like my mother-in-law who suffer from Celiac, but do not want to go about baking with 40 different types of flours. This flour blend is conveniently one mix and only needs the additional purchase of xanthan gum. As complicated as I like making some of my recipes, I know many prefer simple and delicious recipes that take no time at all. And these gluten-free peppermint cookies are exactly that. They take less than 25 minutes to make, including prep and baking. You can add more peppermint extract or crushed candy cane as you see fit, but I don’t know many who are crazy mint lovers. As for the texture and taste, these cookies once again remind me of whole wheat dough. 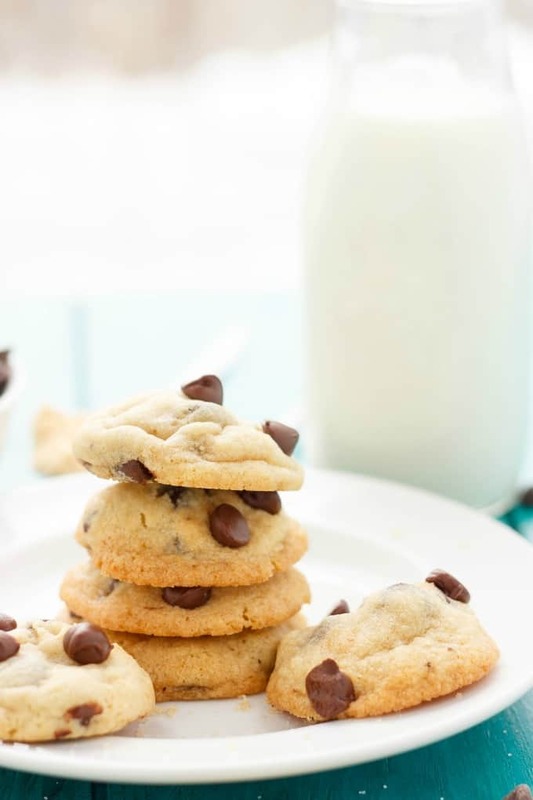 But it is a refreshing change from standard chocolate chip cookies. Maybe one day Robin Hood will perfect their flour, however, as someone who suffers from a gluten allergy, my mother-in-law is quite happy with what Robin Hood has come up with. 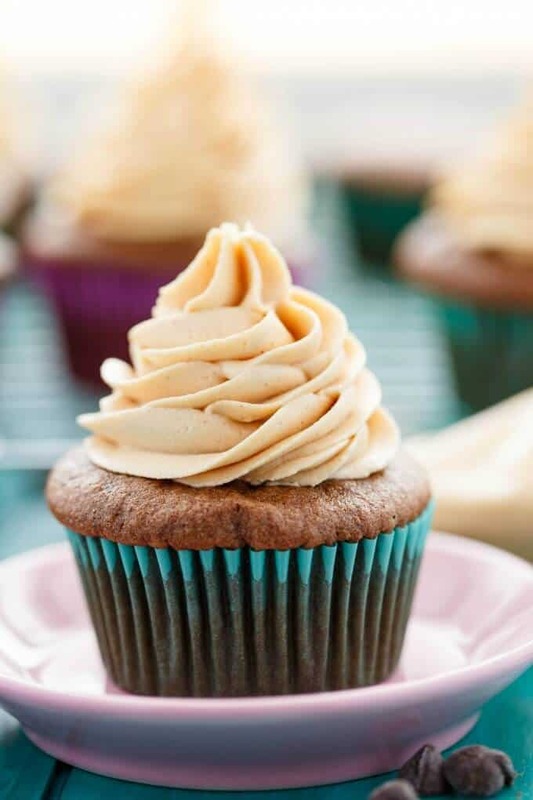 She now gets to enjoy homemade recipes that she would otherwise be missing out on because of the lack of desire to buy so many flours and other ingredients necessary to make some of these gluten-free baked goods. Not bashing other flours, as I am one of those people who loves to try different things when it comes to cooking and baking. However, many do not, and I understand that. 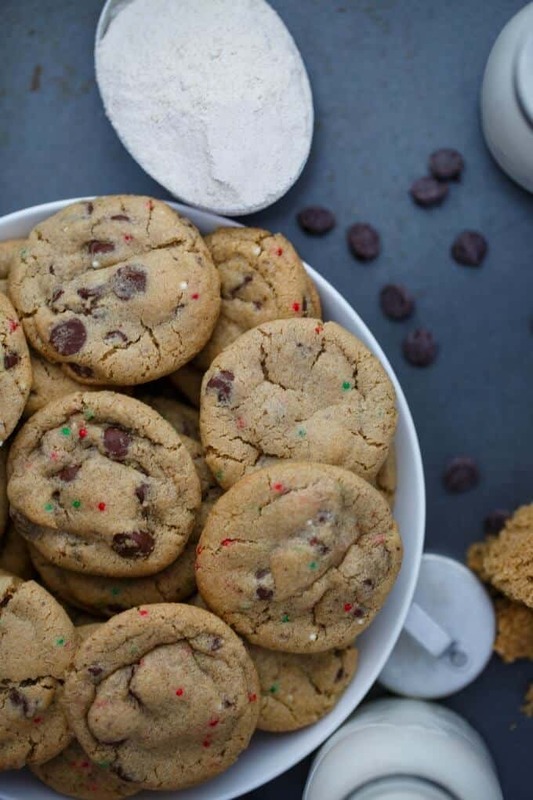 Don't leave your Celiac friends out this holiday season because these gluten-free cookies are super easy to make, and tasty! Preheat oven to 350F. Line baking sheet with parchment paper or silicone liner. Add the butter and sugars to the bowl of your stand mixer. Beat until light and fluffy, about 5 minutes. Add the egg and mix until blended. Pour in the peppermint extract and honey. In a separate bowl mix together flour, xanthan gum, baking soda, baking powder, cornstarch, and salt. Stir to combine. Slowly add to the butter mixer and mix for 5 minutes. 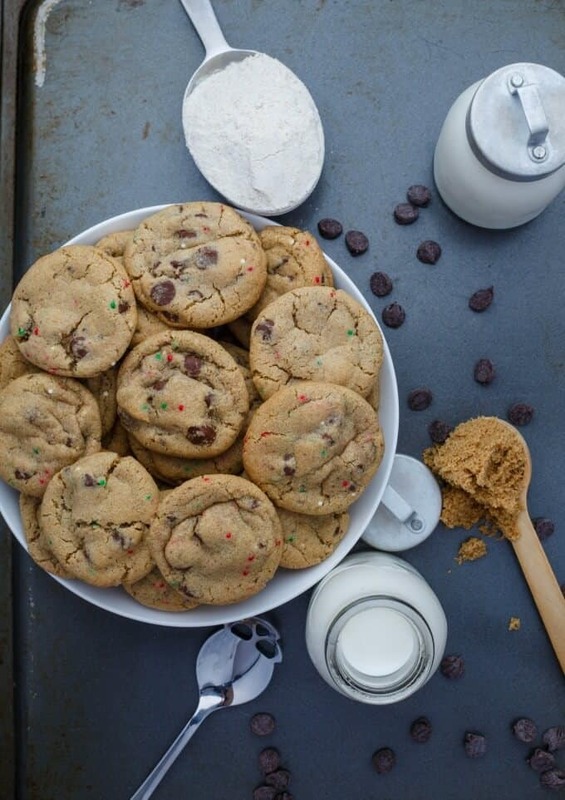 Stir in chocolate chips and crushed candy cane. Measure out tablespoonful-sized portions of dough and roll into balls. Place 12 onto baking sheet. Bake for 8-10 minutes. Remove from oven and allow to cool for about 5 minutes on the baking sheet. Transfer to cooling rack to finish. 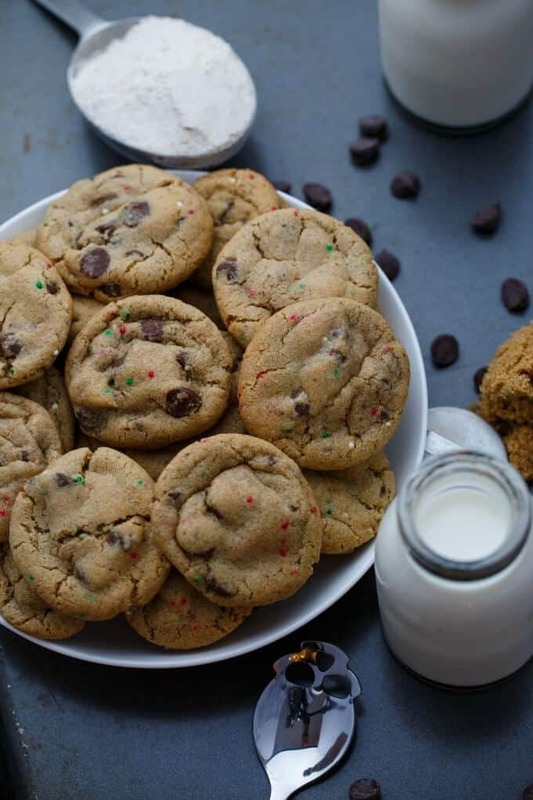 Since there is no gluten-free in this recipe, you actually want to do the opposite of traditional cookie recipes and mix the flour into the dough for 5 minutes to help with airiness. I have one more type of mint cookie left to post, but I will see if I even get around to it this year. With Christmas sneaking up on us fast, I have get all my other Christmas recipes out there before I run out of time!